SoMa is a collaborative research project between the Technische Universität Berlin (TUB), Università di Pisa, Istituto Italiano di Tecnologia, Deutsches Zentrum für Luft- und Raumfahrt e.V. (DLR), the Institute of Science and Technology Austria, Ocado Technology, and Disney Research Zurich. One of the main challenges of robotic manipulation has been the handling of easily damageable and unpredictably shaped objects such as fruit and vegetable groceries. These products have unique shapes and should be handled in a way that does not cause damage or bruising. To avoid damaging sensitive items, the project uses a compliant gripper (i.e. one that possesses spring-like properties) in conjunction with an industrial robot arm. The variation in shape of the target objects imposes another set of constraints on the design of a suitable gripper. The gripper must be sufficiently versatile to pick a wide variety of products, including Ocado’s current range which includes over 48,000 hypermarket items. 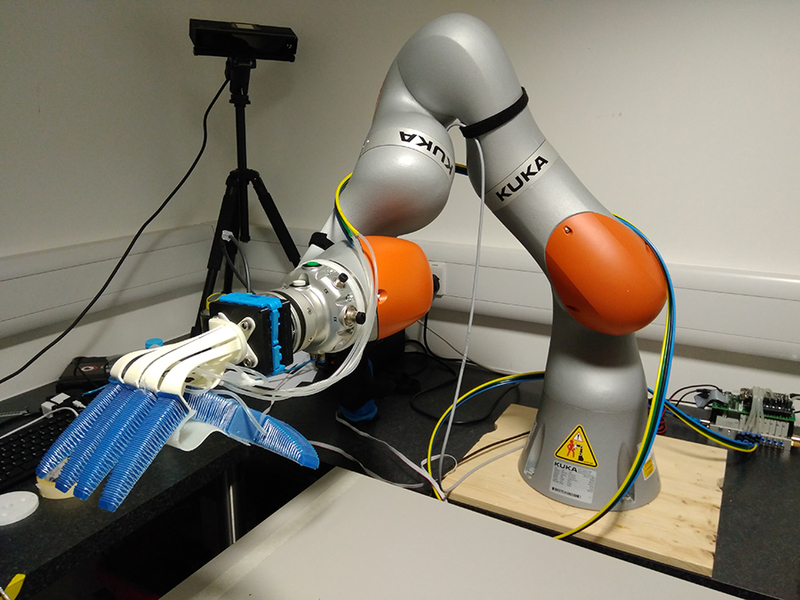 The SoMa project (EU Horizon 2020 GA 645599) aims to design compliant robotic hands that are suitable for handling fragile objects without much detailed knowledge of an item’s shape; in addition, the robotic arms should also be capable of exploiting environmental constraints (physical constraints imposed by the environment). The goal is to develop versatile, robust, cost-effective, and safe robotic grasping and manipulation capabilities. An example of a compliant gripper is the RBO Hand 2 developed by the Technische Universität Berlin (TUB). The gripper uses flexible rubber materials and pressurized air for passively adapting grasps which allows for safe and damage-free picking of objects. With seven individually controllable air chambers, the anthropomorphic design enables versatile grasping strategies. Due to its compliant design, the robotic hand is highly under-actuated: only the air pressure is controlled, while the fingers, palm, and thumb adjust their shape to the given object geometry (morphological computation). This simplifies control and enables effective exploitation of the environment. The Ocado Technology robotics team replicated a production warehouse scenario in order to evaluate the performance of the RBO Hand 2 for Ocado’s use case. 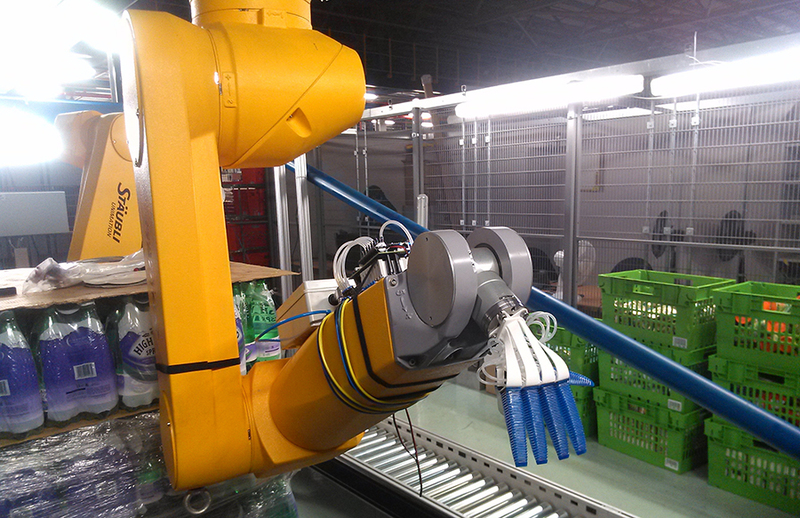 The team mounted the soft hand on two different robot arms, a Staubli RX160L and a KUKA LBR iiwa14. Both of these arms can operate in the standard position controlled mode; in addition to this, the KUKA provides the capability of demonstrating a certain amount of software controlled compliance in the arm. Ocado designed a set of experiments to evaluate grasping performance on an example set of artificial fruit stored in an IFCO (International Fruit Container) tray. The adopted strategies attempted to exploit environmental constraints (e.g. the walls and the bottom of the tray) to perform the gripping tasks successfully. The experiments started with the simple scenario of grasping a single object from the example set using only the bottom of the tray. Initial results showed that the hand is able to successfully grasp a variety of shapes and the results suggested the chance of success increased when environmental constraints are being used effectively to restrict the movement of the object. In the coming months, Ocado plans to explore more complex scenarios, adding more objects in the IFCO, and introducing additional environmental constraints that could be exploited by a grasping strategy.